Is it important for you to grow your business brand, so more potential clients and customers can purchase your products and services? Would you like to get more likes, views and shares for your brand or company on social media? For many marketers, building a social following on our personal profiles is hard enough that building a following for our brand doesn’t even feature on our priority list. But for those small businesses that need to build brand recall and authority, building a following on social media, for your brand profiles, can be exactly what you need to go from an unknown to a well-known brand. In this article, I list eight ways to promote your brand on social media so you can get your business in front of more social media users. 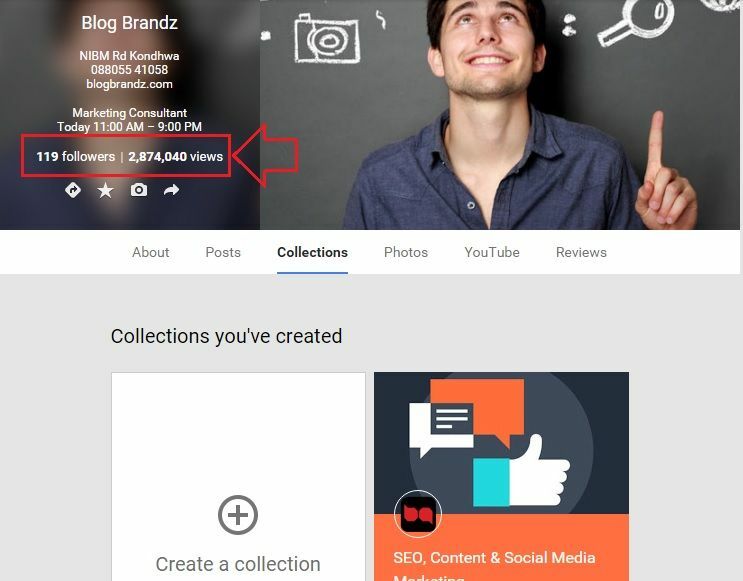 I realized what an excellent tool a Google+ Collection can be to grow followers on social media, after reading Kristi Hines’ excellent post on the topic. 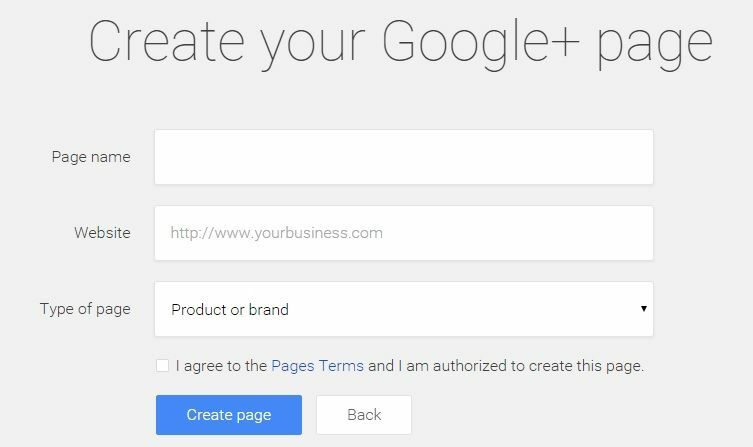 But instead of creating a Google+ Collection on your profile page, I recommend creating one on your Google Business Page instead. 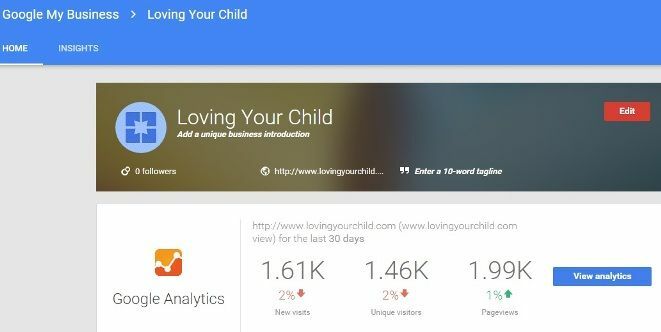 This will not only allow you to grow your followers on your Google Business Page, but also get your brand millions of views on Google+. Every time your followers view, +1 or share content shared from your Collection on Google+, they are, in effect, engaging with your brand. First login to Google with your Gmail address and create a Google+ profile, if you don’t already have one. 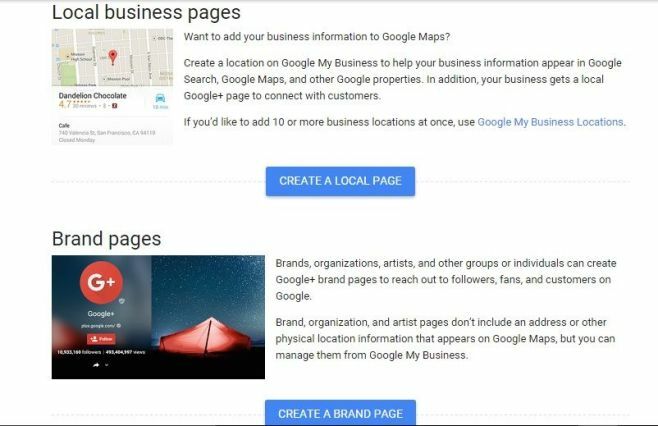 Then go to the link here and create either a Local Business page (if you have a local business presence) or a Brand Page. Once you have created a Brand page, it will look something like this. Click on the link to edit your page and change your header. You will be taken to your new Business Page that looks like this. Now, spend some time filling in all the details about your Brand, your tagline, introduction etc. 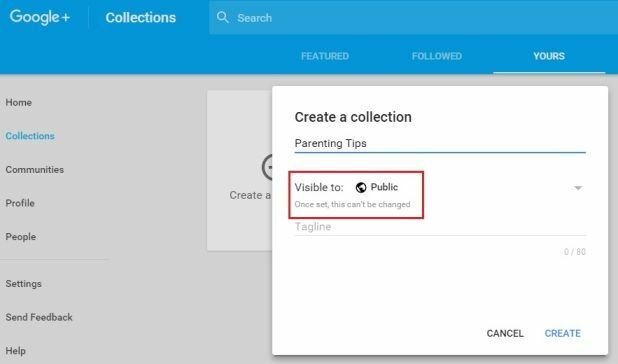 Make sure you label your collection as “visible to the Public” as you cannot change this setting later. 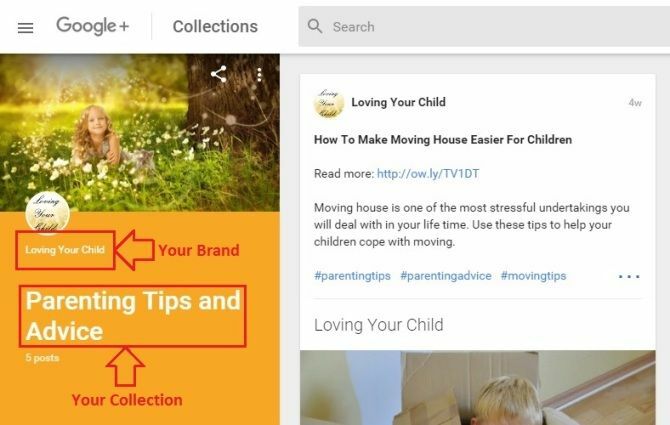 Once you have created a Collection, you can start posting content to it immediately. But before you do that, spend some time customizing your Collection page by uploading an attractive image that defines the kind of content you will be posting. If you create a popular Collection and spend only a few minutes a day posting content to it, you can get an average of 100+ new followers a day, with no advertising spend. It’s still relatively easy to build a following on Google+, like Facebook in the old days, before it became a Pay to Play network. When I see a brand that has not created a Collection on their Google Business Page, I consider it a wasted opportunity to share their content and create more brand awareness on social media. For me, proof that my Google+ Collection was working to bring in traffic was when my traffic stats showed that Google+ had displaced Twitter to become my top source of social referral traffic. Instead of posting your business videos under your personal YouTube profile, create a channel for your brand on YouTube. It will help create better brand recall and engagement every time a viewer watches one of your videos. Make sure you’re signed in to YouTube and then go to the page here. Click on the button that says “Create a New Channel”. You will then be prompted to Name Your Channel and Create a Category for it. Get a unique and attractive header created for your YouTube brand channel. According to the post here, Youtube’s cover art size is 2560 px X 1440 px. Don’t post the same videos on your brand profile that you would post under your personal profile. Create special content for only your brand channel viewers, that is targeted at attracting the right audience – one that is interested in your products and services. See how Steve Dotto does it on his DottoTech YouTube channel. Steve shows that he respects his viewers by creating professional content that engages and informs them. 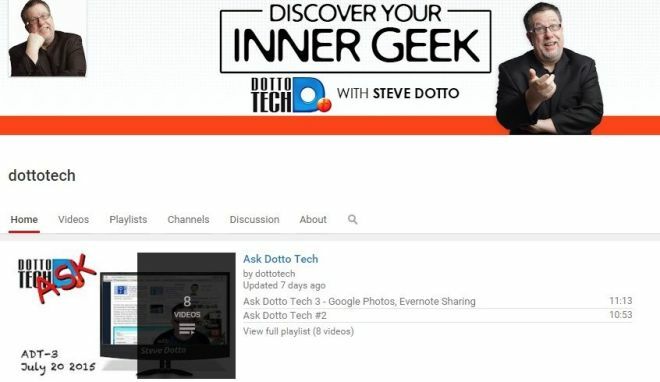 Every time viewers watch his videos, they are engaging with the DottoTech brand. 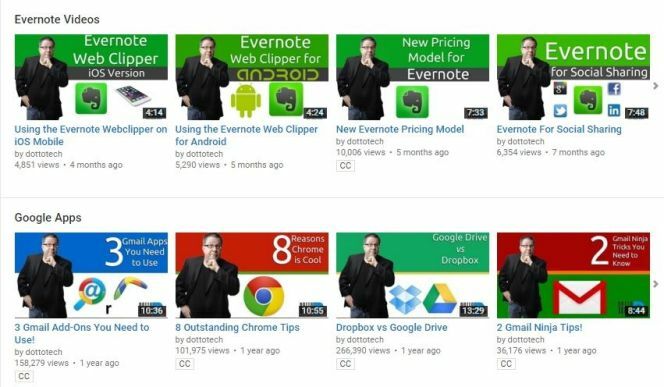 An excellent branding tip from Steve is to create custom thumbnails that reinforce your brand personality and make your videos easily recognizable in the YouTube feed. Most of us that use Pinterest have been browsing it and sharing content on it from our personal profiles. If you want to brand your company on Pinterest, you need to change how you use this network. 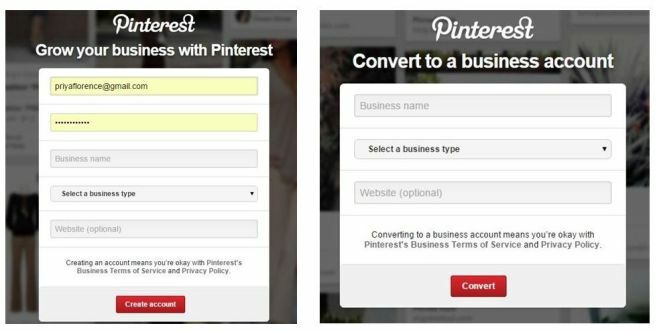 You can either go to the link here to create a new Pinterest Business Page or click here to convert your existing Pinterest personal account to a Business account. 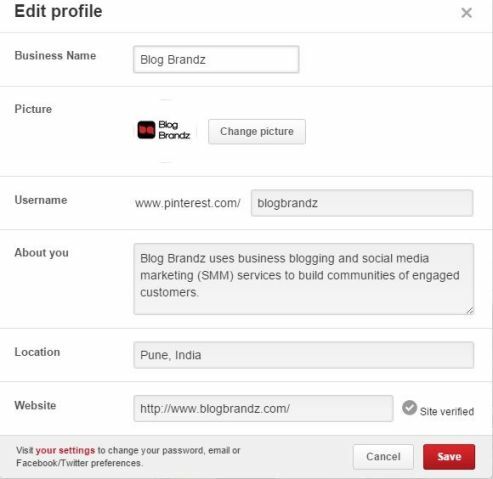 Edit your profile, add your brand name, logo, and description and verify your business website with Pinterest. You’re now ready to start pinning content to your Pinterest brand channel. Your Pinterest Business page can grow brand awareness of your ecommerce store on Pinterest, and also increase your traffic and sales. When Etsy user, Rachel Ball of Elephantine began using Pinterest to help promote her shop, average views per week increased by 22%, and sales per week increased by 20%. If you want to continue sharing content from your personal Pinterest account, you can create shared boards for your business and personal account, so that you can share the same content to both accounts at the same time. This is especially useful if you want to share your blog posts to both your personal and business page followers. To grow your followers on your Pinterest brand page, share images that will attract the kind of followers you want. Create Pinterest Boards based on different categories. Do some research on different kinds of boards that people in your industry create and give your boards interesting names. You can even create a collaborative board by allowing other people to post to your board. This attracts more followers and benefits everyone, because you now have more people promoting and pinning content to your board. To monitor your results on Pinterest, you need to pay close attention to your metrics – likes, repins – and see what kind of content resonates with your buyers. Check out this post for more ways to grow your Pinterest followers. Most of us are so busy growing a Twitter following on our personal accounts that we neglect our Twitter brand accounts. Yes, I’ve been guilty of this myself. One of the reasons it’s much easier to build a following on a personal Twitter account, is because Twitter users prefer to interact with a real person than a brand. But if you want your brand account to get followers and shares on Twitter, you need to give it some love. 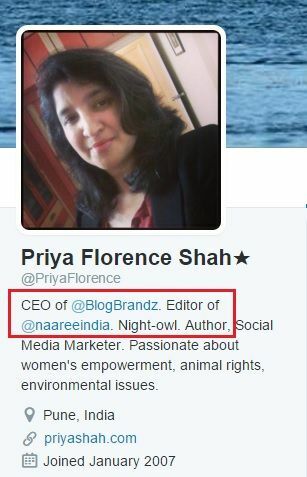 The first step to doing this is to mention your Twitter brand handle in your personal Twitter bio. Occasionally make a post about current events using trending hashtags, even if it’s not related to your business. Use no more than two relevant hashtags per tweet to boost discoverability. You can even create a unique hashtag for your brand and use it in posts on your Twitter business profile. Louise Julig reported on how Travelocity created the most successful social campaign in the company’s history and led competitors by an average of 5% in unaided brand awareness during the #IWannaGo campaign. For more ideas to promote your brand hashtag, check out her tips for a killer hashtag marketing campaign. You can also start a Twitter ad campaign, to build followers or increase tweet engagements, for your company Twitter account. Twitter has a number of options for advertising, but for the purpose of building a brand on Twitter, the Promoted Accounts or Promoted Tweets advertising options can help boost your follower growth and get Twitter followers to engage with your tweets. These ads are best used when you want your brand to be more discoverable to other Twitter users. 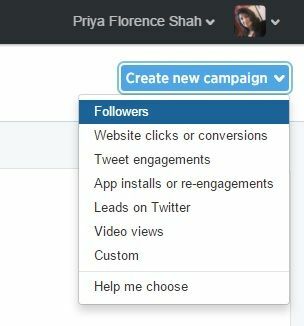 To create a Twitter ad, login to Twitter and click here to go to the campaigns dashboard. Then click on the button that says “Create new campaign” and it will open out into various options based on your ad objectives and goals. You will then be taken to a page where you can setup your campaign, select your audience and targeting criteria, set your budget, and choose your creatives. To get the best ROI from your Twitter ad campaign, target people with similar interests to your competitors. Test different messages to learn what works best for your audience. Let your brand personality shine through in your tweets and ads. Even though it’s easy to create a LinkedIn page for your brand, it’s not easy to grow your followers on it. LinkedIn doesn’t provide much help in this regard, either. But there are ways you can grow your followers on your LinkedIn Company page. In his article on Forbes, Jayson DeMers recommends that you use the LinkedIn company follow plugin to put a follow button on your website or blog. Go to the link here to generate the code for your follow button. 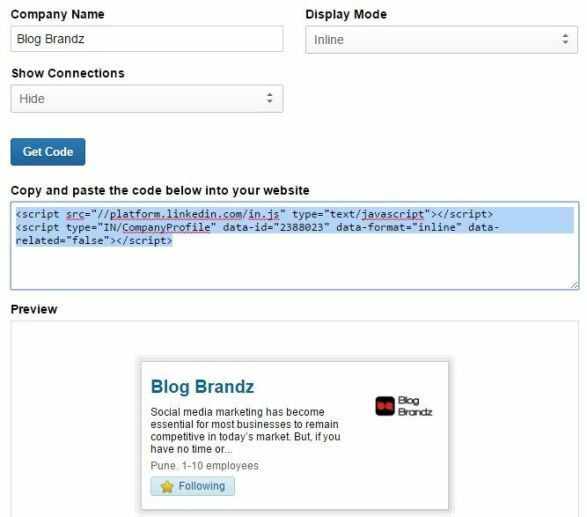 Then copy and paste the code generated into a widget in the sidebar of your WordPress blog. In the same way, you can also go here to add a company widget to your website’s sidebar. This is how the code should look when you’re done adding both of the elements above to your website sidebar. Another way to make sure that your LinkedIn network can easily find your Business Page, and click on it, is to clearly mention it at the top of your LinkedIn profile. DeMers recommends optimizing your Company page with relevant keywords so that it can be easily found in search engines, and making your posts more sharable by posting video and trending posts from LinkedIn Pulse. Other recommendations include creating multiple LinkedIn showcase pages, which give you more occasion to be found in search engines and by other LinkedIn users, and asking your employees to share your brand page content. See how Hootsuite Media Inc. posts updates with helpful tips and insights around social media, continuously providing value to their followers. They also make announcements of new Hootsuite features on their LinkedIn page. For more tips to promote your LinkedIn Company Page, check out LinkedIn’s Best Company Pages in 2014 and LinkedIn’s resources on what makes a Company Page shine. The first step to promoting your brand on Facebook is to create a page that you can use to promote your brand. Now there are two ways you can go about this. Your brand page will bear the name of your company and will be your brand’s connection to your customers. If you’re a global brand, you can and should create localized pages for each country, as Dell India does. The purpose of a brand page is to connect with your brand’s fans and share updates related to the brand. 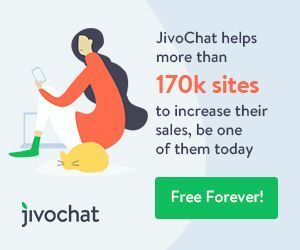 As many fans join brand pages for the purpose of discounts and freebies, it’s a good idea to grow your following with contests, deals and offers. A community page is built for the purpose of growing a community of fans who are passionate about a cause or share a common interest. An example would be the Dell’s Social Media For Business branded community page, created around the topic of using social media to promote your business. On this page, Dell posts updates related to social media and how businesses are using it to grow their brand. As it’s a pretty hot topic among business owners, this community page helps Dell target the kind of audience, i.e. businesses, that may be interested in purchasing a Dell computer some day. It may also be easier to grow a fan following for a community page around a hot topic of interest. The best way to grow your fan following on both, your brand and your community Facebook pages, is to post engaging content, and use Facebook advertising to boost Facebook likes, promote certain posts, and run contests and promotions. Facebook advertising is cheap, has multiple options and is a very effective way of getting attention for your brand. If you own a local business, running Local Awareness ads is one of the best ways to target people who live in a specific radius around your business address. When it comes to getting more brand views and mentions on social media, influencer marketing is working very well for those who know how to leverage it. A study by Influencer Marketing Platform, RhythmOne showed that marketers who implemented an Influencer Marketing program in 1H 2015 received $9.60 in Earned Media Value (EMV) for every $1.00 of paid media spend. (Earned Media Value refers to the media value that can be attributed to publicity, social sharing and endorsement through audience engagement). Their 2015 (1H 2015) Influencer Marketing Guide also notes that Instagram is the best performing Social Amplification channel. Working with influencers to create custom content is one of the most important steps to getting them to promote it for you. 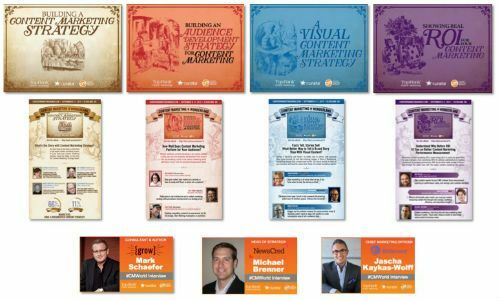 In 2014, TopRank Online Marketing worked with Content Marketing Institute to create an influencer content program to promote the Content Marketing World conference. They worked with over 40 marketing industry influencers, compiling their insights into four visual ebooks, long form interviews with select influencers, and four infographics featuring Tweetable quotes from each influencer. The eBooks earned thousands of social shares, over 145,000 views on SlideShare and 20,000 page views on TopRankBlog. By the time the conference was held, there were 2,000+ PDF downloads, 800 leads and 200+ event referrals. Aligning your brand with a cause gives you a meaningful way to connect with customers who support that cause, and get more social media shares and mentions in the process. When it comes to cause marketing, authenticity and alignment are everything. The best kind of cause to align with is one that is relevant to your brand and your products or services. One of the best ways to get others to commit time or money is to give to that cause yourself, notes David Brown. Aaron Steed and his brother Evan started Meathead Movers because they needed to find a job with a flexible work schedule to accommodate their academics and their athletics projects. They found a meaningful way to give back to the community by partnering with Good Shephard, a non-profit, that helps families at risk, move for free. By relocating victims of domestic violence, their firm provides an incredibly valuable service to those desperate for help. Read more about their inspiring story here. 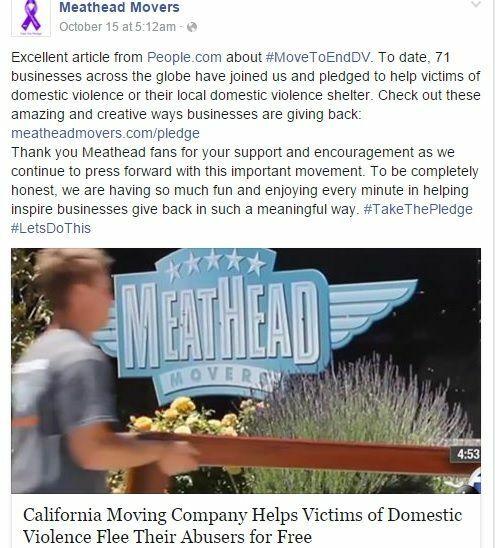 Because Meathead Movers have to protect the victims of abuse, their cause doesn’t lend itself to self-promotion, but it did get them some great press in People Magazine and a bunch of social media attention. 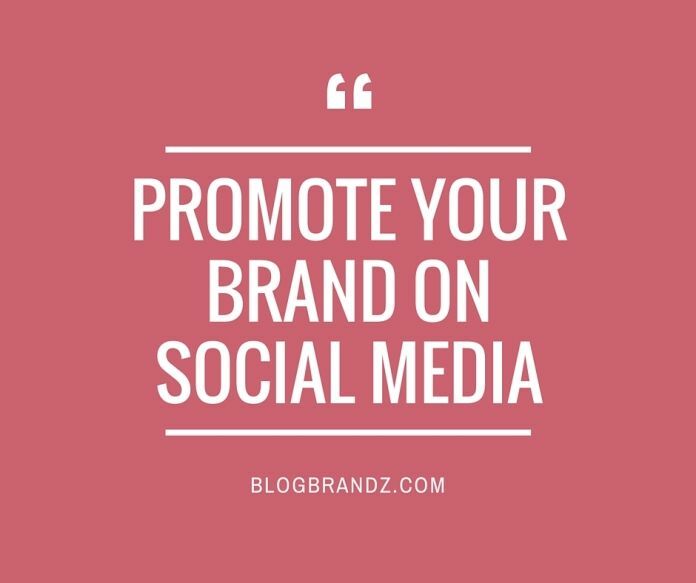 Did you like these tips on how to promote your brand on social media? Do let me know in the comments below.